On March 1, an uncommon thing happened in Los Angeles; it down poured rain for hours. This area rarely sees much rain in March, and when it does it’s usually not torrential. While most people took cover, about 50 people slogged onward in calf-deep and sometimes knee-deep water. Just hours earlier in beautiful, sunny weather they had set out on their 3,000 mile journey across the country, taking the first of about 7 million steps in the direction of Washington, D.C. to raise awareness about climate change. Some of the people there were not walking the whole way; instead, they were there in solidarity of those who were. A group of local students pushed a giant, fake polar bear on a cart, and when the cart could not be pushed through the mud and water anymore, one of the students put the polar bear on his back and pushed onward. This nine-month, cross-country walk is called the Great March for Climate Action, and it follows in the footsteps of past influential marches, like Gandhi’s Salt March and the March on Washington of 1963. Janen Kendall, 63, a full-time marcher from New York City, said she admired the determination of the young people who walked with them that day. With two cases of minor hypothermia that day, Program Director Jimmy Betts, 30, said it was the most miserable experience that many of them had ever been through, but the important thing was that they did it together. Betts said the purpose of the march is to give people the opportunity to unite and organize to create the world that we need. Participants are invited to walk as much as they want, whether it be for the whole event or just for a day. There are currently 235 people signed up to walk sections or the whole thing. They represent 36 states and five other countries: Canada, Belize, Ecuador, Belgium and Bangladesh. I am one of 14 marchers from New York. 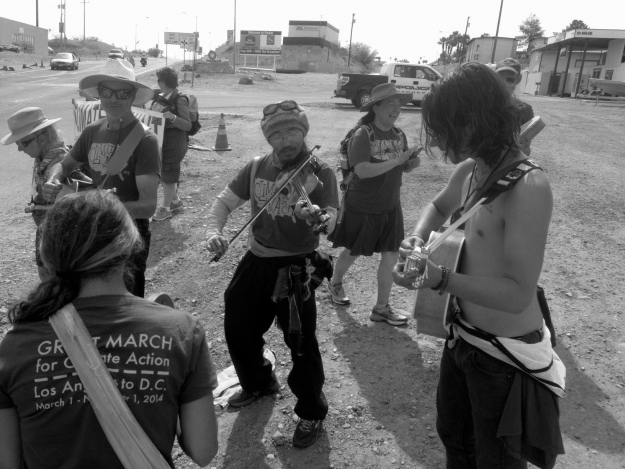 I will begin in Taos, N.M. on May 25 and walk the remaining 2,000 miles to D.C. Our expected arrival date is Nov. 1. Kendall, who retired early so she could focus on the environmental movement, said although it was difficult to just leave her life for so long, the action was needed. Kendall grew up on a farm in Vermont and said she experienced a turning point when she visited Pennsylvania and witnessed the communities affected by hydraulic fracturing. “Fracking” is a process of extracting natural gas, and an Associated Press investigation released in January found that it has caused well water contamination in at least three states. Kendall said a local resident told her that her and her husband couldn’t have their grandchildren visit them anymore because it was no longer safe. New York is currently experiencing an intense, ongoing debate about whether or not to ban fracking within its borders. Like Kendall, I am concerned that what’s happening in Pennsylvania may become a reality for my home state in the near future. Wilmington, Calif. was chosen as the starting point on March 1 because, like communities in Pennsylvania, it has been negatively affected by pollution and growing industries. Kendall said the city has a large number of children with asthma caused by air pollution. The march will travel through many major cities, including Phoenix, Denver, Chicago, Cleveland, Ohio, Pittsburgh and more, and while passing through marchers will take the opportunity to talk to citizens and officials about climate change. Kendall said that the response from the communities they’ve traveled through so far have been great and largely supportive. An example of this came when the Climate March tweeted that Jonathan Rothschild, mayor of Tucson, Ariz., declared April 8, the day the march is scheduled to pass through Phoenix, as Climate Action Day. According to Betts, the marchers begin their days before dawn, with breakfast prepared and served by 6 a.m., and they leave camp by 7:30 a.m. at the latest. While the march was traveling through the Mojave Desert it was important they walked as much as they could before the heat of the afternoon. Sweaty and tired, they complete their daily mileage between 2 and 3 p.m. They work together to cook dinner, which is served at 5:30 p.m. Afterward there is a group meeting or, if one is scheduled, a presentation to the local community. A fire and music concludes the night if they are camping outside — Betts said he learned to play the fiddle specifically for the march. Everyone is in bed by 9 p.m., getting their much-needed rest so they can do it all over the next day. Betts said while the marchers primarily camp outside, they have also stayed the night in several other places including churches, a mosque, a gymnasium, a date palm tree farm and the Joshua Tree Retreat Center in Joshua Tree, Calif., which claims to be the oldest retreat center in the Western U.S.
Kendall said she loves the community that they have established and that her favorite part of life on the march is learning from the other marchers. Betts said the marching community is very rare, and that it presents a completely different way of living and human interaction. Betts has traveled all over the country to work with sustainable food systems and organizations interested in renewable energy, as well as teach martial arts, natural medicine and meditation. He said his passion for the environment started as a child. Betts is also an ordained minister, which came in handy when two Climate March participants decided they wanted to get married in the midst of this historical event. Ki Coulson, the march’s state coordinator for California, has been with her partner, Taylor Miller for about 10 years, and they have had a domestic partnership since 2012. Miller, 33, proposed to Coulson, 32, last October. In his first ceremony as an ordained minister, Betts married Coulson and Miller on March 13 at the Joshua Tree Retreat Center, just days after the pair confirmed with him that they wanted to move forward. Miller said she picked out her dress in one 45-minute visit to a bridal boutique, and their small wedding cake said “Happy Birthday Kai & Taylor,” misspelling Coulson’s name. Coulson was about an hour late for the ceremony, which only lasted five minutes. Afterward, the marchers threw them a surprise reception. Coulson and Miller both said the spontaneous, unserious atmosphere of the wedding made it perfect. Miller said she knew how much the march meant to Coulson and it made for a great backdrop. As state coordinator, Coulson was responsible for organizing the successful rally in Wilmington on the first day, and she found places for the marchers to stay each night in California. Coulson said she will be in Phoenix on April 7 for the Arizona rally, and she and Miller will participate in the march together for the final three week stretch between Pittsburgh and D.C. Although I have not yet joined the march, when I spoke to Betts, Kendall, Coulson and Miller, they treated me as though I was already a part of the community. They said things like ‘I wish you had been there’ and ‘Faith, you would have loved this,’ and they all said they couldn’t wait to meet me. I cannot express how much I am looking forward to May 25. It takes passionate and determined hearts to make change, and the Great March for Climate Action happens to have a surplus of those. This is a relief to me, because we are in dire need of change if we want to have, in Kendall’s words, a “recognizable and livable” future. Kendall said her participation in the march has stirred up interest and awareness among her friends and extended family. “[When] the issues that we’re all concerned about start bubbling up at dinner tables in all kinds of households … and there’s that sense that all Americans are taking ownership of this, that’s when concrete specific change will happen,” she said. The Climate March hopes, and already is, stimulating a national conversation that cannot be ignored, one that cannot help but lead to action. Faith Meckley is a freshman journalism major who will be investing in a really good pair of sneakers. Email her at fmeckle1[at]ithaca.edu.